← Best Salmon Patty – So Far! We’ve been off the road and in our little farmhouse a year now and what a year it has been. Lots of repairs and redoing and it is slowly become our little piece of heaven in the country with beautiful view of the Olympic mountains. We’re finding we don’t even miss our once favorite view of the water (the Straits of Juan de Fuca) – the ever changing view of the mountains is outstanding. In between the remodeling, which Roy is doing 90% of, I’ve been having fun learning to cook and operate in the smallest kitchen I’ve ever had! Challenging, but I’m beating it! And, it’s time to get back to recording some of the dishes we’ve enjoyed. Today, I’ll start with 3 recipes which we will be repeating quite often. Trim the tenderloin of any silver skin, but leave any fat for flavor; there won’t be much. Cut the tenderloin in half a put in a sturdy (if using Sous Vide) plastic bag. 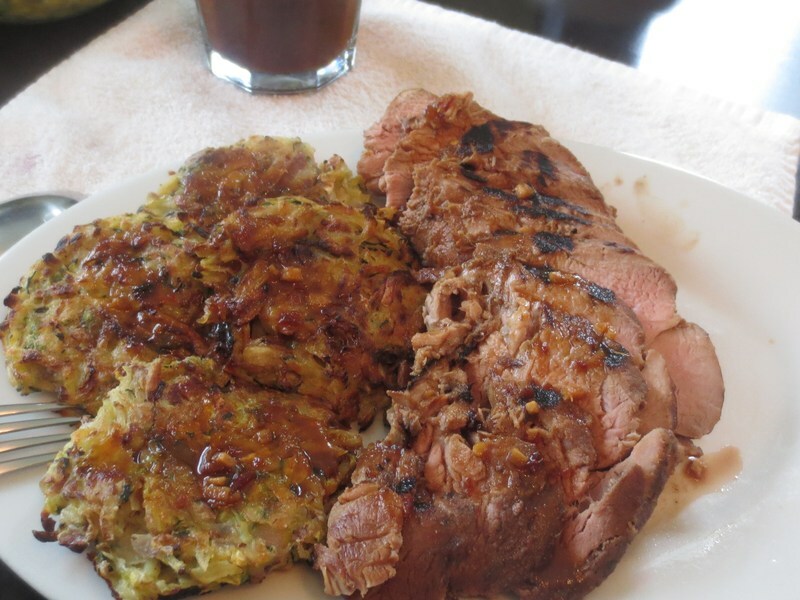 Whisk together the marinade ingredients and pour over the pork. Seal baggie and refrigerate for 1 to 1 1/2 hours turning them after 1/2 hour. Option 1: Heat grill over medium heat and lay the pieces of tenderloin on the grill. Grill and turn every 4 to 5 minutes until pork reaches 140°F internal temperature. Option 2: Sous Vide the pork – Put one of the pieces in a 2nd baggie. Sous Vide at a temperature of 140° for 2 hours. 15 min. After 2 hours, heat a grill and when hot, drain the marinade from the pork, reserving the marinade. Grill the pork pieces over a hot grill just to give color. After pork is done, allow to rest for 10 minutes before slicing. In a small saucepan, heat the marinade to a boil, then let simmer for 2 minutes. Serve with the pork. Whisk together the slaw dressing ingredients and refrigerate until ready to use. To finish dinner: While the tenderloin is grilling, toss the slaw with the dressing and season to taste with salt and black pepper. Slice the pork and serve. 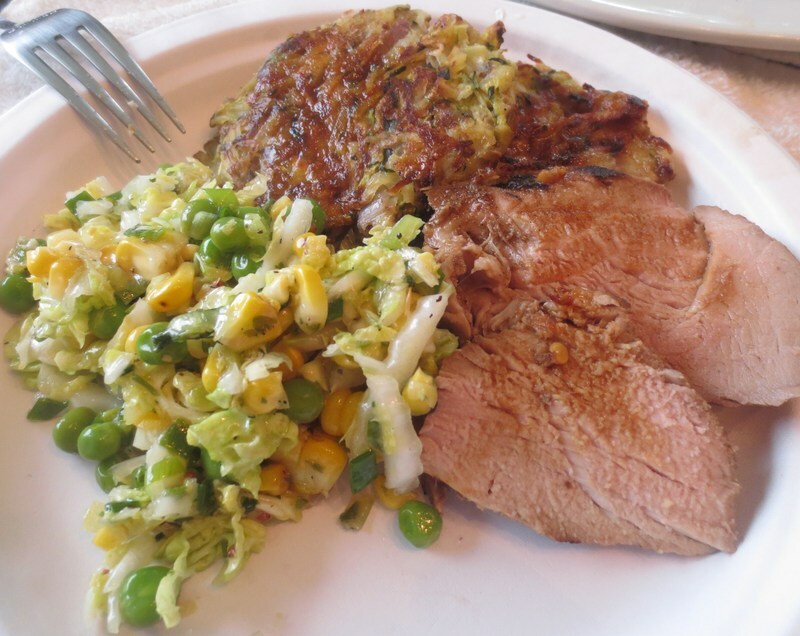 I had Potato & Zucchini cakes in the freezer and added a couple to our dinner – turned out to be a great combination with the pork and slaw and the marinade drizzled over all. These are a handy side dish to have at the ready in your freezer. Combine zucchini and 1/2 tsp. salt in a colander. Let drain 5 minutes, then wring dry in a kitchen towel. Transfer to a bowl and add remaining ingredients together, except the oil. Heat oven to 375° F. Pour 2 T. oil onto a sheet pan. Drop potato mixture onto the oiled baking sheet by 1/4-cup measures and flatten to 1/2 “ thick. Oven-fry the cakes for 10-15 minutes; turn over and continue baking until nicely browned. Hope you’ll enjoy these dishes as much as we did. Next will be playing with the leftovers, but they just may be the Hoagie I mentioned above. Thanks, Jean. I’m glad you started writing again. Always love to know what you’re cooking. Would also love to see/hear more about your little piece of heaven. I can’t wait to see it all painted up in red, my favorite color! Thanks Maryann – I had to stop painting for months it seems, because I’m using water-based paint and this is the northwest….. one day it’ll be dry enough to continue. Jean so glad your doing this again. I always enjoyed it also and hearing about house and farm.